Caregiver benefit: Introduce a new caregiver benefit that’s meant to help families copy with illnesses and injuries. 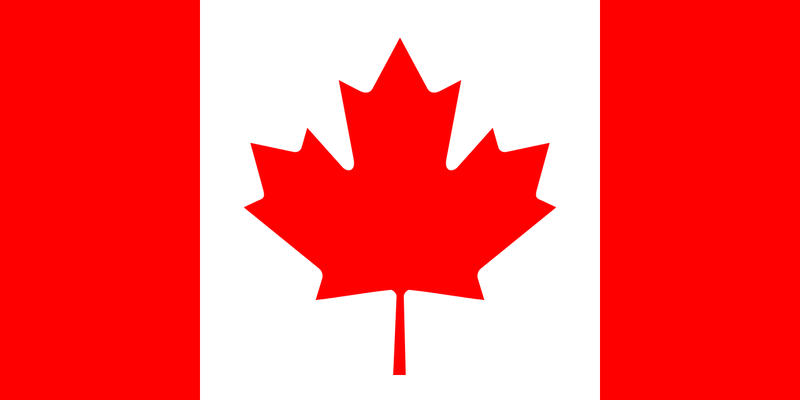 Parents who go to school: Single, higher federal income threshold for part-time students to receive Canada Student Grants. Grants don’t have to be repaid. Foreign Nannies: Waiving a $1,000 processing fee required to obtain a work permit. With the tax filing due April 30, we've included some tax deductions for families to notice for the 2016 taxation year. With the tax filing due April 30, we’ve included some tax deductions for families to notice for the 2016 taxation year. 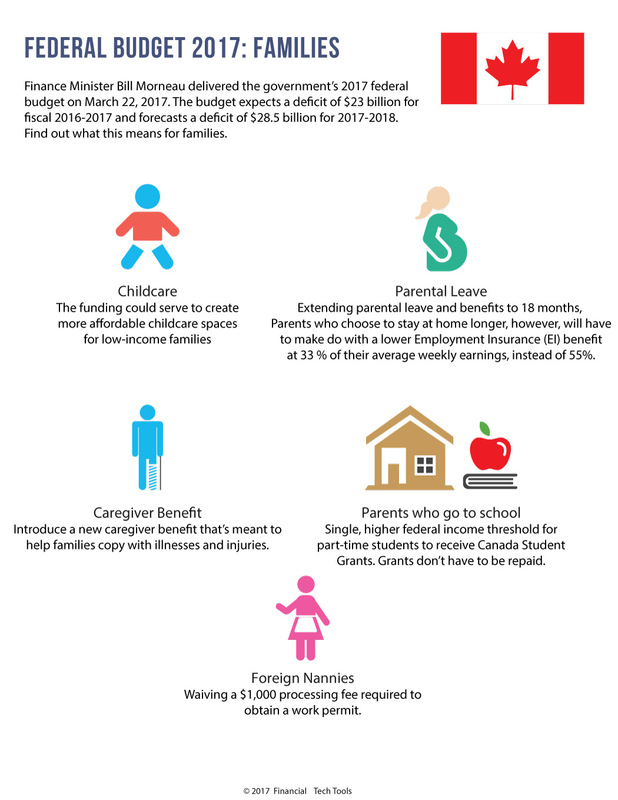 Canada Child Benefit: The Canada child benefit is a tax free monthly payment to help eligible families with the cost of raising children. 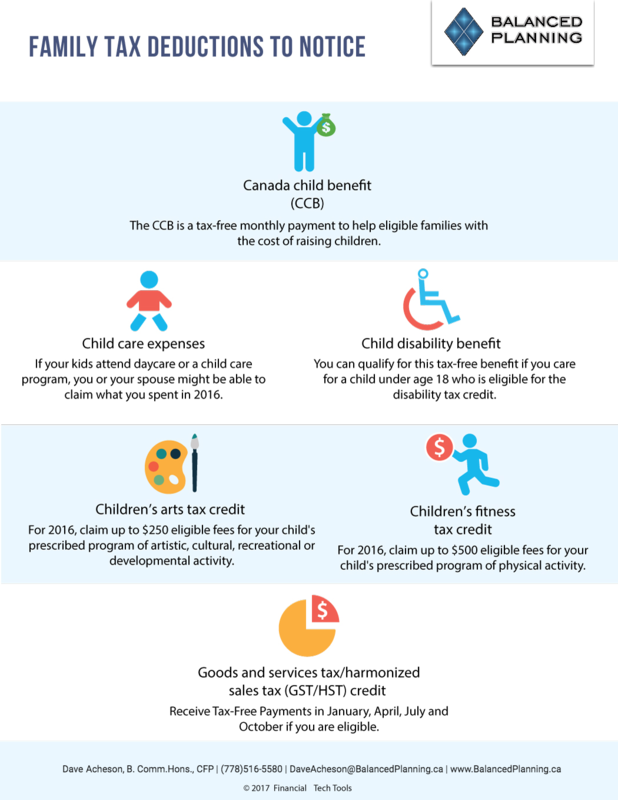 Child Care Expenses: If your kids attend a daycare or a child care program, you or your spouse might be able to claim what you spent in 2016. Child Disability Benefit: You can qualify for this tax-free benefit if you care for a child under age 18 who is eligible for the disability tax credit. Children’s art tax credit: For 2016, claim up to $250 eligible fees for your child’s prescribed program of artistic, cultural, recreational or development activity. Children’s fitness tax credit: For 2016, claim up to $500 eligible fees for your child’s prescribed program of physical activity. GST/HST sales tax credit: Receive tax-free payments in January, April, July and October if you are eligible. If you have any questions, please contact us and we can connect you with a tax professional. With the tax filing due April 30, we've included new tax highlights for the 2016 taxation year. 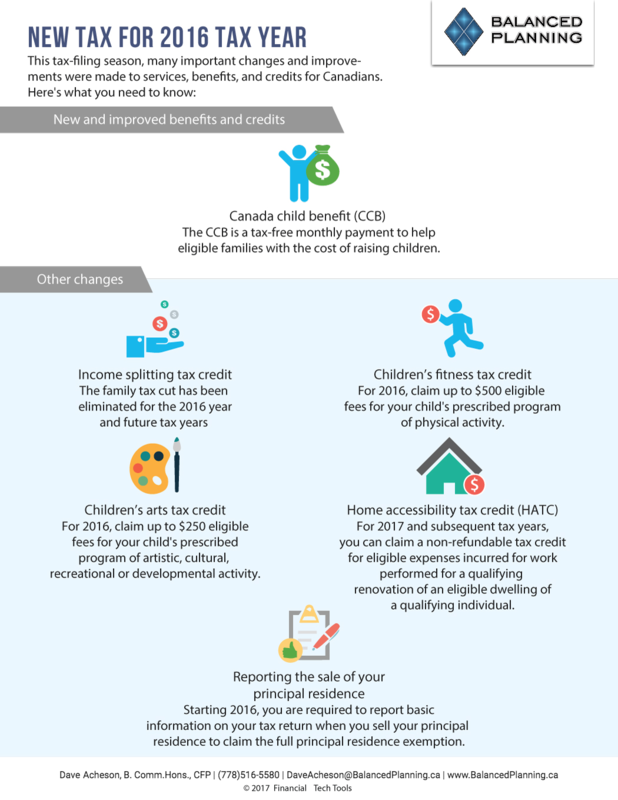 Income Splitting Tax Credit: The family tax cut has been eliminated for the 2016 year and future tax years. Children’s Art Tax Credit: For 2016 claim up to $250 eligible fees for your child’s prescribed program of artistic, cultural, recreational or developmental activity. Home Accessibility Tax Credit: For 2017 and subsequent tax years, you can claim a non-refundable tax credit for eligible expenses incurred for work performed for a qualifying renovation of eligible dwelling of a qualifying individual. Reporting the Sale of Your Principal Residence: Starting 2016, you are required to report basic information on your tax return when you sell your principal residence to claim the full principal residence exemption. BC Finance Minister, Michael de Jong delivered the province's 2017 budget on Feb. 21, 2017. 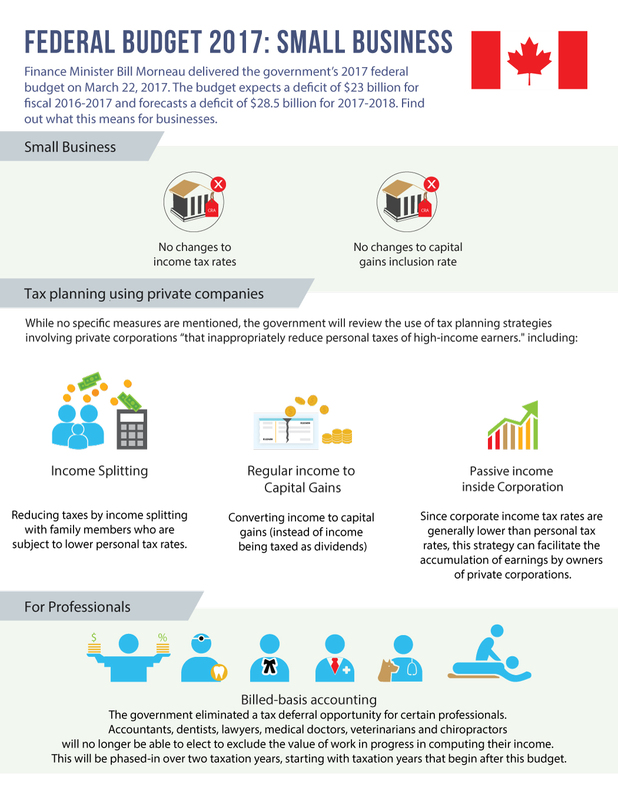 Learn what the budget means for small business owners and individuals. 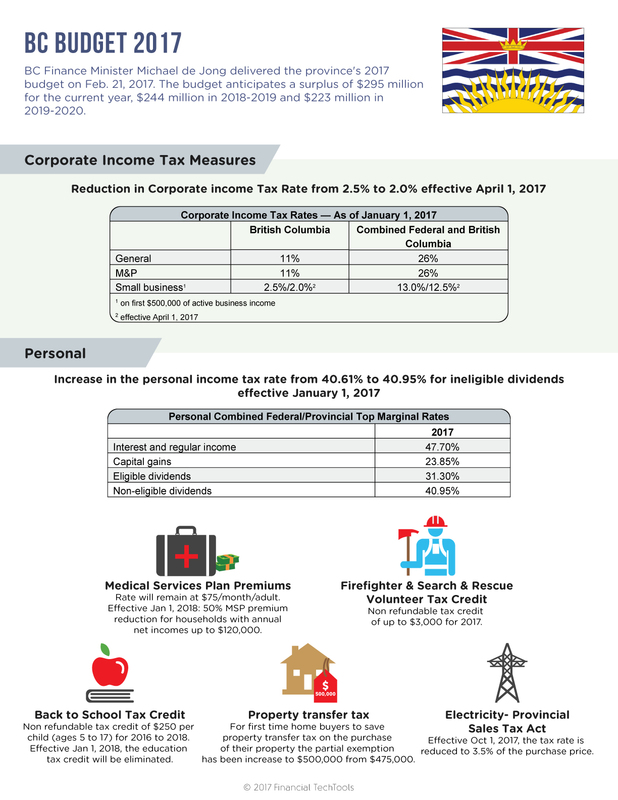 Increase in the personal tax rate from 40.61% to 40.95% for ineligible dividends effective January 1, 2017. Medical Services Plan Premiums: Rate will remain at $75/month/adult. Effective Jan 1, 2018: 50% MSP premium reduction for households with annual net incomes up to $120,000. Firefighter & Search & Rescue Volunteer Tax Credit: Non-refundable tax credit of up to $3,000 for 2017. Back to School Tax Credit: Non-refundable tax credit of $250 per child (ages 5 to 17) for 2016 to 2018. Effective Jan 1, 2018, the education tax credit will be eliminated. Electricity- Provincial Sales Tax Act: Effective Oct 1, 2017, the tax rate is reduced to 3.5% of the purchase price. Property transfer tax: For first time home buyers to save property transfer tax on the purchase of their property the partial exemption has been increased to $500,000 from $475,000.